The moon calendar came about firstly through Freda’s interest in the many cultures and times when the moons provided a map of the year. Much of the moon calendar art and symbolism is based on European mythology. Pagan cultures were focused on the Earth and nature and natural forces. Since Freda has always used natural forms including the human in her art, the two interests came together in this product. However, Freda continues to produce fine art prints on many subjects and some are for sale here, together with those of her partner Peter. 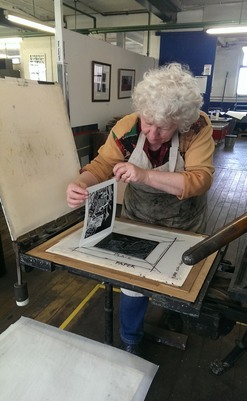 We offer limited edition prints made with our own hands using surface or relief printing such as lino and collograph, or intaglio prints using acid etched or dry point engraved plates. Details are presented with each print, but are generally editions of 30 (we want to get on and create the next one). They are mounted using acid free board, but not framed. They cost £60 up to A4 size and £100 up to A2. However you can have a digital print also mounted on board for £10 up to A4 or £20 up to A2. Gallery and details start here on our sister site Blue Ball Art. Freda at Hotbed Press in Salford.